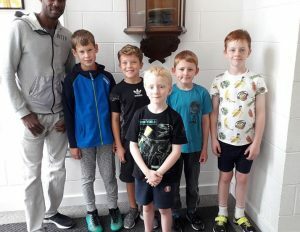 Former 2002 Commonwealth Games and 2003 World 100m Champion Kim Collins from St Kitts and Nevis recently visited The Pearson Centre for Young People in Beeston, Nottingham during a visit to the area. Kim, 42, retired at the end of this summer from sprinting. His career has spanned over 20 years competing at international level for most of that time. He former competitors have included Linford Christie, Usain Bolt, Dwain Chambers, Justin Gatlin to name but a few. His career started before Usain came onto the scene and went on beyond Usain’s retirement. At the age of 40 he broke the world record for 100 metres – which he still holds. Pretty impressive that someone can remain at the top of their sport for such a long time. Kim visited The Pearson Centre and took some of the children through a typical sprints warm up. He also joined them for a trip to the cinema.